Whether it’s designing a centerpiece for home or an event, perusing the aisles for tools for a school project, or locating a frame for that beloved photograph, it’s likely you’ve found yourself inside an arts and crafts store at some point. From cloth patterns to drawing pencils to blank canvases and custom framing, these craft supply stores are just what creative people look for in a retailer. With the rise of ecommerce, arts and crafts stores are just as accessible from the comfort of your computer or mobile device. For artists and crafters, something is undoubtedly lost when shopping online for these kinds of supplies, but the ease of online shopping is undeniable. 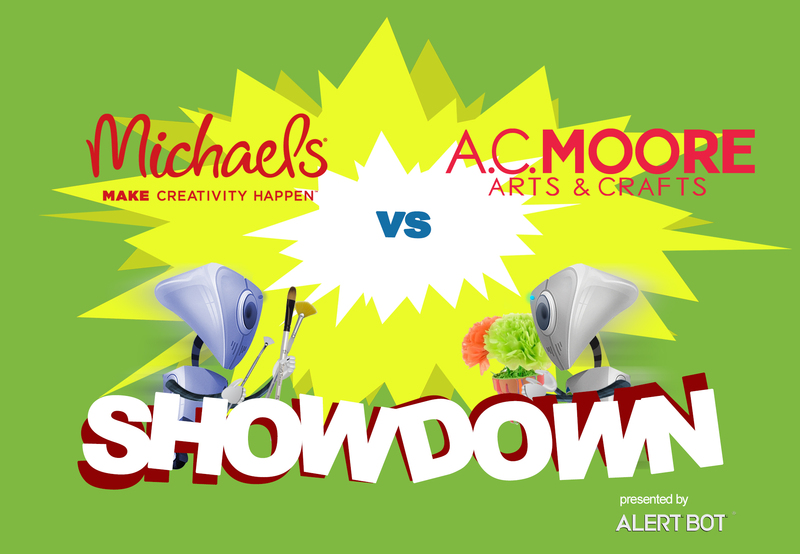 Two of the biggest players in the market are Michael’s and A.C. Moore, so for this, our ninth, Showdown, we’ve pit the web performance of these two leading crafty retailers against each other. 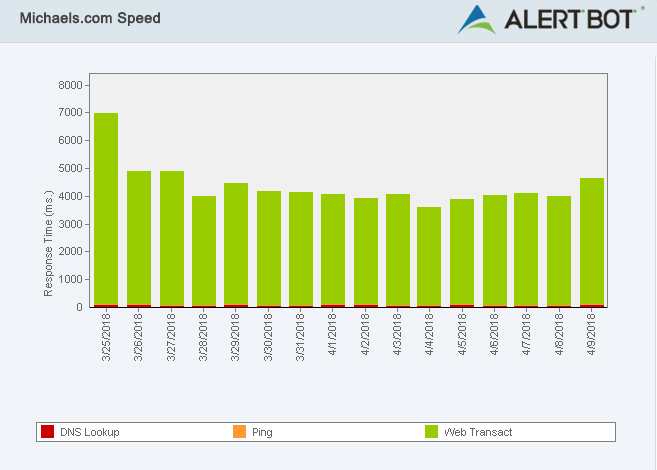 We used AlertBot’s external website monitoring system and its TrueBrowser™ technology to monitor both sites for a couple weeks, spanning from March 25, 2018 to April 8, 2018. As expected, both sites performed quite well, but as in most cases like this, one site saw better results than the other. Both websites did really well here, with neither site seeing any significant, true downtime. 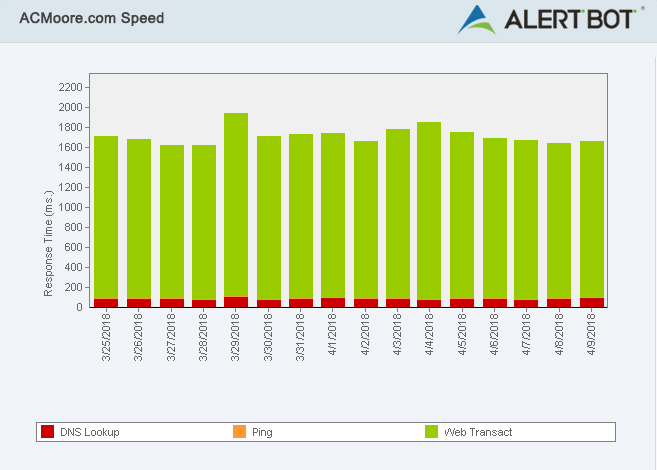 Comparatively, ACMoore.com saw 100% uptime with no significant failure events. However, there were still 4 recorded moments where there was a slow file and 4 occurrences of when the page itself took longer to load than expected. 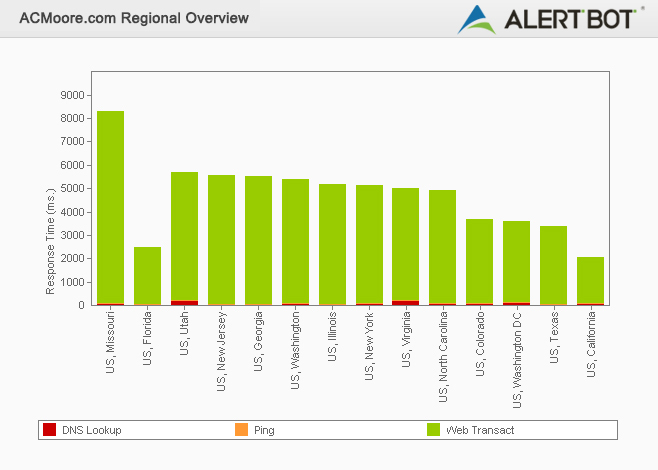 Still, ACMoore.com never actually went down, so we have to give them high marks for that. For usability, we select a common task a user might typically try to accomplish when visiting the sites and replicate it. For our previous Showdowns, we tested things like going through the motions of ordering movie tickets from a local theater or simply adding a similar item to both sites’ shopping carts. For this Showdown, we’ll see what the experience is like to use their respective websites to find some paint brushes, add them to the shopping cart and start the checkout process. For each of these processes, we started by opening a new tab in Mozilla Firefox and typing in the site’s URL. From the point of typing www.michaels.com into our Firefox browser and searching “paintbrushes” in the product search box, it took 30 seconds and 4 clicks to select a pack of brushes, add them to the cart and view the cart. It was definitely a smooth experience. 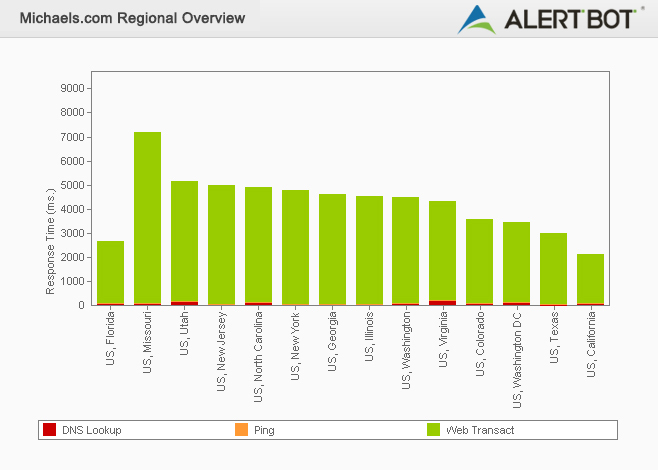 ACMoore.com was, unfortunately, a far more frustrating experience. Upon visiting the site, we were hit with a pop-up asking for us to signup for their email list to get a coupon. Plus, their signup box at the top of the page is typically where a site search would go, so it’s easy to mix them up (despite the “Sign Up for Offers” label next to it). It didn’t take long to discover that their site also doesn’t seem to specialize in craft materials, as a search for something as basic as “paintbrushes” returned nothing. We tried altering the wording in our search a bit but gave up after reaching a minute and a half. To be fair, we decided to run the usability process again with different search criteria. ACMoore.com seems organized by craft project ideas, without any real discernable things you can purchase from their site (and yet, they have a shopping cart), which makes the sites quite different from each other (and gives Michaels.com an edge over ACMoore.com in sheer product availability and variety). In the end, while the brick and mortar stores are very similar, their online presences are not. So we decided to run it again to see how fast we can get to, and briefly look around, their individual Weekly Ads. 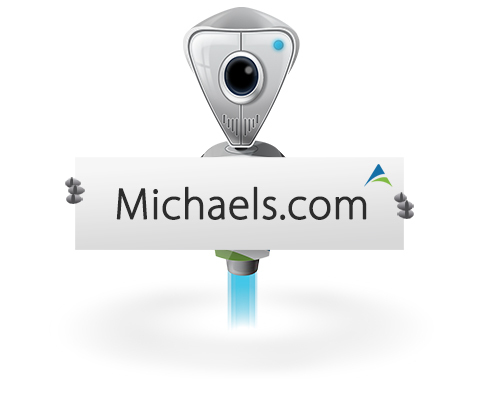 For Michaels.com, it took about 2 clicks and roughly 10 seconds to get to the Weekly Ad for May 6 and start clicking around. It offered two choices for ads, but we chose the basic ad for the week to browse. It was a very easy experience. For ACMoore.com, it took 20 seconds, 3 clicks and typing in our zip code to get to our local area A.C. Moore store’s ad before we could start clicking around. The ad isn’t nearly as thorough or as nice as Michael’s is, either.